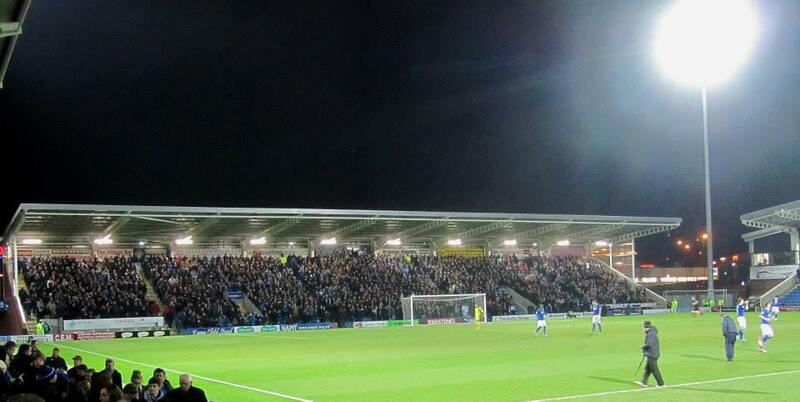 On Tuesday 18th February 2014, I went to the Proact Stadium to watch Chesterfield take on Fleetwood Town in the second leg of the Johnstone’s Paint Trophy Northern Final. Getting the chance to see your team play at Wembley Stadium is a dream for any football fan. Tonight, Chesterfield had the opportunity to fulfill this dream for the second time in three years! The Spireites had defeated Mansfield Town, Rochdale and Oldham Athletic on their way to the northern final of the Johnstone’s Paint Trophy, a competition that they had won in 2012 – beating Swindon 2-0 at Wembley. 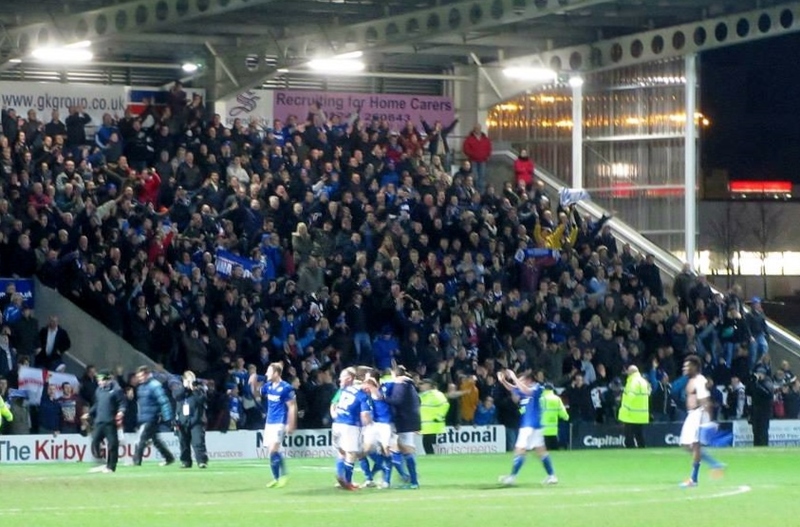 All that was standing between Chesterfield and a return to the national stadium was a two-legged tie against League 2 rivals Fleetwood Town, who had already knocked out four teams from division above (Tranmere, Crewe, Carlisle and Rotherham) to reach this stage. 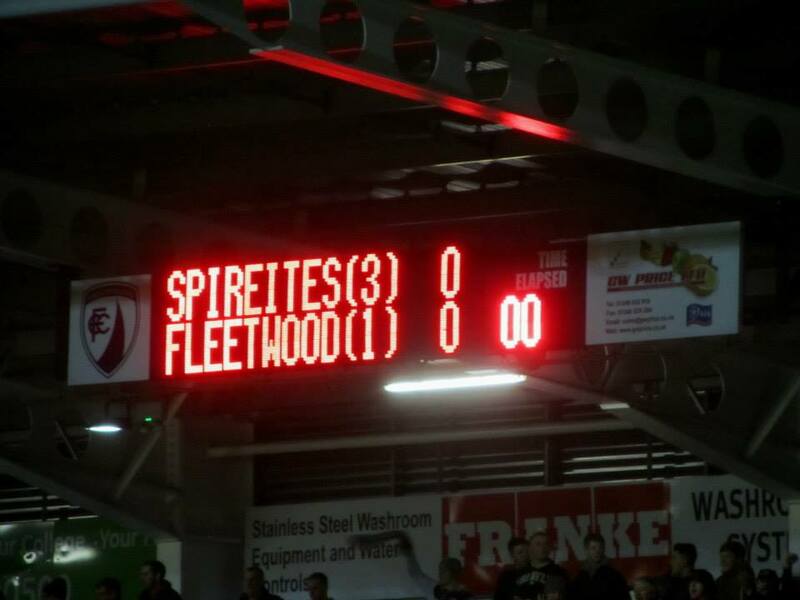 The first leg of the tie had taken place two weeks previous at Fleetwood’s Highbury Stadium. Goals from Ian Evatt, Sam Morsy and Jimmy Ryan had seen Chesterfield come away from the seaside town with a 3-1 advantage, giving themselves an excellent chance of reaching the final. However, anything can happen in football and the tie was far from over. It could all change in these 90 minutes at the Proact. There was a buzz of anticipation inside the stadium as kick off time approached. The first chance of the game fell to the visitors, Jon Parkin sending a tame effort wide of Tommy Lee’s goal. The opening stages of the contest were quite even, with both sides knowing that the first goal of the game was vital. Another goal for Chesterfield would make it 4-1 on aggregate and leave the away side needing a monumental effort to pull it back, while a goal for Fleetwood would make the Spireites with just a slim one-goal lead to hold on to for the rest of the evening. 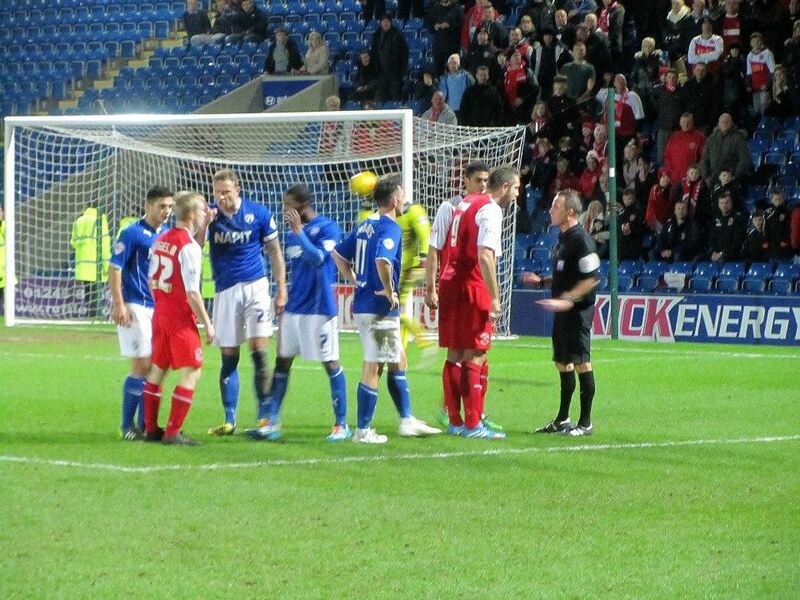 Chesterfield’s Lee was the first goalkeeper to be forced into making a save, Gareth Evans hitting a low strike that the ‘keeper managed to keep out. Lee was almost caught out when Parkin spotted him off his line – the striker’s attempt from around the halfway line flying quite a way off target. Despite the two-goal aggregate advantage, the Spireites weren’t sitting back. Marc Richards came agonisingly close to opening the scoring when he got on the end of Jimmy Ryan’s cross, his close-range header only stopped by a fingertip save from Chris Maxwell. Jay O’Shea then had the best chance of the first half when Gary Roberts played him through on goal, but the Irishman’s shot was kept out by another good save from the Fleetwood stopper. As the game entered the second period, the Cod Army became more desperate to find a breakthrough as they piled on the pressure. Parkin hit a volley over the crossbar from the edge of the box before Evans forced another great save from the goalkeeper. 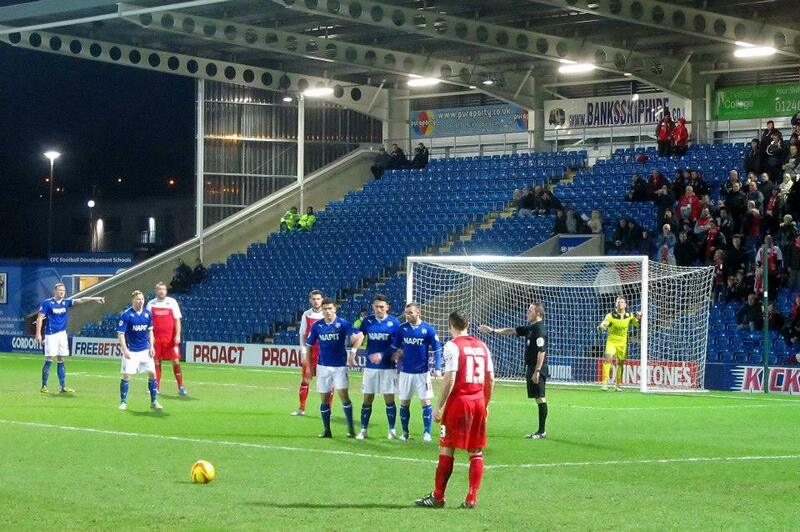 However, the Chesterfield back line remained solid and continued to hold on to the lead. Substitute Eoin Doyle should have put the tie beyond doubt in the final 10 minutes. Roberts’ cross found the striker with a free header in front of goal. Much to the anguish of the tense home fans, Doyle somehow managed to directed the ball wide of the net. Minutes later it was the away supporters turn for a moment of disbelief. Parkin was found just yards from goal with the simplest of finishes, but the veteran forward instead rolled a weak strike into the arms of the thankful keeper. In the final minute of normal time however, Parkin made up for his earlier error by setting up a tense conclusion. Chesterfield failed to properly clear from a set piece, and the ball eventually fell to the striker who poked home to put Fleetwood one goal away from taking the tie straight to penalties. The six minutes of stoppage time seemed to last forever for the nervous Spireite supporters. However, the home side managed to hold on to book their place at Wembley Stadium on 30th March where they will face Peterborough United. There was huge delight at the final whistle, fans and players staying behind to celebrate and enjoy the moment. For many, seeing your team at Wembley is a once in a lifetime event. 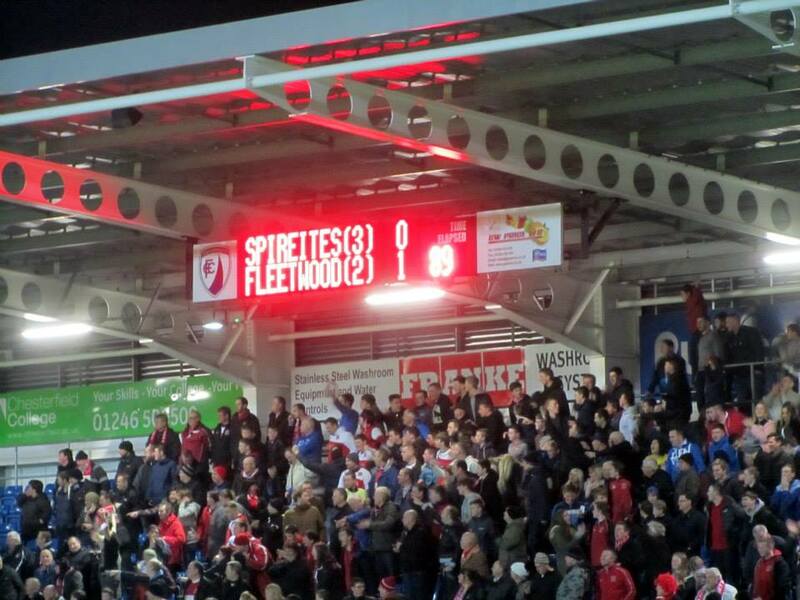 For Chesterfield fans, it’s happened twice in three years! Roll on 30th March!